Above all, put on love, which is the perfect bond of unity. “Honey, I want us to think about what ‘put on love’ means. Every morning we spend time picking out what we’re going to wear. We go back and forth deliberating and often spend too much time stressing about what to put on because we want to get our outfit just right. Translated from the Greek, ‘Above all and put on’ references the metaphor of an upper garment. Paul commands us to ‘put on love.’ We are to make a daily choice to intentionally clothe ourselves with His character qualities, the chief of them being love. You know there are times I don’t pick out the godliest outfits. Too often I clothe myself with selfishness and judgement, laziness and frustration, instead of putting on love. But what grace that we don’t have to sleep in the same clothes every day! My daughter and I continued to sort through this very real struggle, because let’s be super honest for a minute, this isn’t solely a heart check for teen girls, is it? I wrestle with this everyday. Like my daughter, I have a list of reasons why it’s too difficult, too awkward, and bottom line, uncomfortable. Often I choose to give and receive love from the pretty, the popular, and the lovable. And as a good church girl, we chalk that up to doing the right thing, but that’s a cleaned-up, easy version of authentically loving our neighbor that doesn’t cost us much. When loving is hard and costs us something, that is the true antidote to our own self-centeredness. It demands we deny a lifestyle of lip service fueled by tidy coffee dates together amid comfortable conversations. The people in our lives who aren’t the easiest to love push us to a deeper level of dependence on God and prayer. Even after decades of naming Jesus as Lord, it still doesn’t come naturally for me. 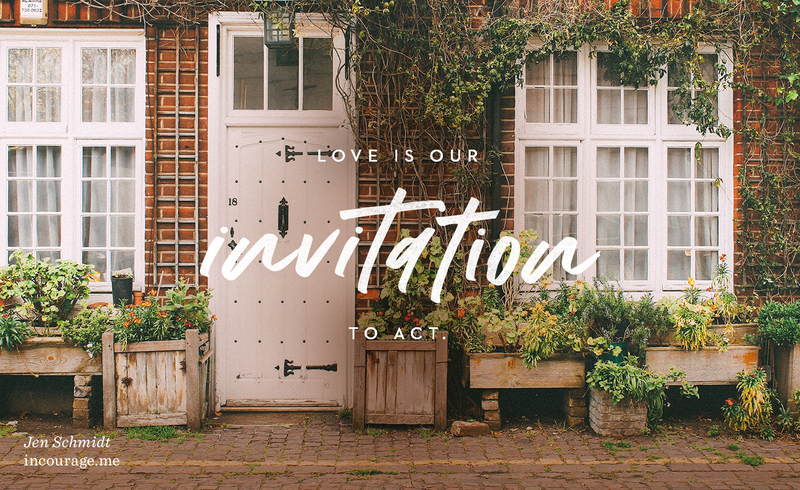 But love is our invitation to act. We have a choice to love others as we love ourselves, and in that choice we become more like Him as we let the Holy Spirit tutor us on loving in the hard places. In the end, I almost let my daughter out of the situation because it would’ve made mothering in the moment so much easier, but part of my role in modeling for and discipling my precious daughter is to invite her to do the hard things alongside me and point her to Him in the process. It can be a challenge (especially when I mess up), but it’s always worth it. I wrote out Colossians 3:14 and taped it to my bathroom mirror. As I get dressed in the mornings, I want it to be a tangible reminder to proactively choose to put on love, as I pray that the Holy Spirit will help me gracefully step into those hard to love situations when I feel like retreating. And I don’t like it one bit, but I know where I am supposed to start. This post was first featured at (in)courage: find yourself among friends. If you need a constant place of encouragement, head there. I have those moments, too, where mothering would be easier if I don’t make them do this or I do let them do that… It’s a never ending. Thank you for encouraging us to do the hard thing because it’s the right thing.